Did someone say board games? I am a sucker for any activity that does not require any internet connection, When In Manila. I have a theory that your brain lags in a specific amount of time when you fester for a long time online. So to take a social media breather, I head to Dyce n Dyne. I was surprised at how easily I could find it. Since I’m from the south, I would usually be waze-dependent but just driving along Pasig Blvd after Kapitolyo, it is almost in front of Seaoil Gas station. Saw it at once. I liked their steam punk themed signage that actually moves. Caught my attention. If you’re a fan of matcha this will not disappoint. 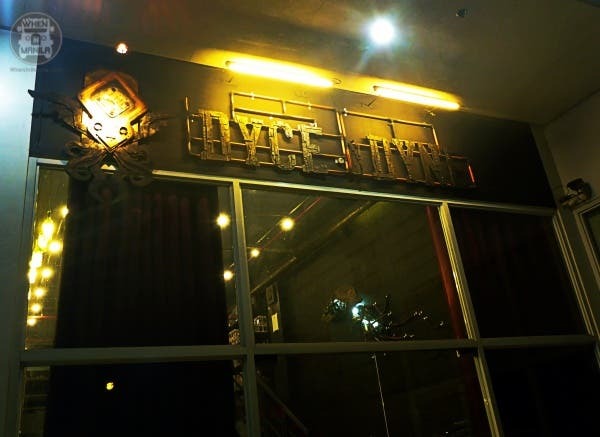 You can try their Matcha Latte or their Matcha Espresso for the ones who need a bit of kick. They also have their version of Milo Dinosaur which is Milo, milk with a generous amount or milo powder on top, really liked these drinks and their beaker containers for your geeky heart. I took so many instagram worthy photos from their interiors. They have these cool elements with their lighting that really tied the Dyce n Dyne ambiance together. Can I just say that the #1 priority I have when I go to a restaurant or bar is the people? Dyce n Dyne have a cute quirky crowd that made me embrace my quirky side! Did someone say bacon?? Try these Bora bora bacon tempura. They’re breaded bacon with a really good sweet and savory sauce to dip it in. Need something to munch one while you’re having an intense game of 789? 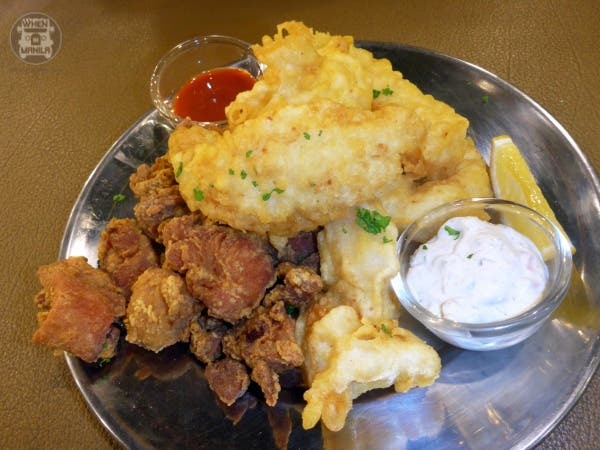 Order some Fish and Karaage. BEST THING ON THE MENU (in my opinion) was this crispy on the outside steak. Comes with truffle mashed potatoes and awesome gravy. If you’re in a mood for dinner, this would be perfect. This is new on their menu it’s pulled pork with coleslaw and fries. Good with a glass of any fruit tea formulas. Their coleslaw was fresh and crunchy! Catch Some Pokemons with this Hot Pokemon Trainer!